Prior to this week's precipitation event various weather events resulted in a variable mix of rain crusts, facets, surface hoar, and wind crusts. The new snow, depending on elevation and aspect will be sitting in top of a different surface (or weak layer) even in our general area. This complex and variable layers will require of us to be prudent and keep angles below 35 or exercise "due-diligence" with stability tests as we are moving and skiing around. In other words, the variability the snowpack structure is "high" and skiing steeper lines will require "lots" of stability assessment. I went out and toured at Pilots today. The snow pack was quite scary. There is 10cm of consolidated gropple and warm snow on top of 30 cm of very light, fist snow, ie the recent storm is upside down. This is all sitting on the old snow base. The stability testing showed a compression test that failed at 2 with Q3 at the gropple soft snow interface. The ECT was failed at 7 at 40cm( the new snow old snow interface) and propagate across the entire column with a Q3 shear. There was a lot of whumping. It was also snowing at over 2cm an hour with ridge top winds out of the W/SW at 30-40mph when I left. Yet another red flag. If you head out be careful. It was a beautiful day for a tour up a low angle ridge. Notice that the testing revealed evidence of easy triggering (CTE) and propagation potential ( ECTP). Whumping, "upside-down" snow, and strong winds are "red" flags. Q3 results (Low likelihood of slip potential) can easily change with slope angle, and character of the fracture plane. As commented earlier we have a variable layer of wond and rain crusts that could easily change Q scores as aspect and elevation changes. Gary and I had surprisingly good skiing at Pilot today. We got there expecting the hazard to be too high to do anything but tour up and back down the ridge. Ski pole probes into the snow showed it's really upside-down. But we dug a pit at the top of Knob Ridge, around 7100, and did two CTs that produced the same result, CT27 Q2, and the ECT didn't propagate at all. Gary had summit fever, so we skied to the top of Pilot, still skeptical about conditions. But given the low angle of Knob Ridge, we decided it would be safe. After the first run, Gary said, correctly, "that's what backcountry skiing is all about." Shallow but creamy new powder atop a crust that actually held us up. We had to ski a second lap before coming down. There is skiing to be done, and these friends carefully evaluated the slope to be skied. They did not find evidence of stability at the selected slope, and had GREAT skiing. However, aspect, angles, and elevations can change the nature of the snowpack. Check the next update from Freeman for the SAME day! Today Tom and I made a trip up to Freeman Peak. We wanted to report on conditions as we found some snowpack stability issues that are worth reporting. We dug a pit near the lower ridge saddle and were surprised to obtain two CTE (CT4 then a CT10) compression tests at 40 cm. We found burried facets at the interface between the old snow from a month ago and the new 40 cm of snow from this last round of storms. Sheer quality was Q2. A propagation test produced an ECTPV -11. It seems that the facets from the long stretch of warm days and cold clear nights were burdend by the recent heavy and wet snow accompanied by a few rain events. We detected other ice layers (15 cm) above the failure layer at 40 cm. We opted to ski a 24 degree slope and observed no additional signs of instability on the lower slopes. We later skinned up to the upper snow slopes beyond the upper ridge saddle. On our ascent, we observed a recent avalanche across the SE drainage of Freeman on a SE aspect of Freeman. We skied the skiers right of the upper snow field and again controlled our angles and skied slopes nearing 25 degrees. On this run, we observed several recent avalanches on the N, NE and NW aspects on either side of our moderate angle. These slides occurred on slopes <35 degrees and failed at that 40 cm weak interface. We exited to the drainage on a steep ridge and observed another recent slide there. While skinning up to the ridge at the start of our outing, neither of us felt that snow conditions were as unstable as they proved to be. Tom and I were both very glad that we had the presence to follow the guidance that I received from your class and ski lower angled slopes. We just wanted to report what we found so others might be aware that instabilities exist. Last Sunday, during an AVI L1 class we were surprised about the sensitivity of top 25 cm of snow at places were it had densified (formed slab). The conditions were predominantly "dust on crust". But at selected test areas we had test with CTEQ1-SC (sudden collapse) results. Also, ski cutting at a steep roll-over produced fracture propagation and dislocation of a small slab. The new low density snow received last weekend was deposited in top of facets resting above of a rain crust. Depending on elevation the rain crust was decomposing into facets. The recent snow is making this weak layer interface now buried 40 cm our biggest concern for this weekend. Thanks to Chip, Mike and Dusty for sharing your observations! Additional snow is expected for this weekend, and the skiing promises to be terrific. This is a great time to seek that friend that completed an AVI course to have him mentor you on stability assessment. Or perhaps, for those that are eager to practice their skills in terrain management, take out your inclinometers and carefully manage slope angles. Keep in mind that conditions are highly variable with respect to snow stability, but Mores Creek Summit has many, many, many areas where it is possible to have a great skiing and never be exposed to steep terrain or avalanche terrain with terrain traps. 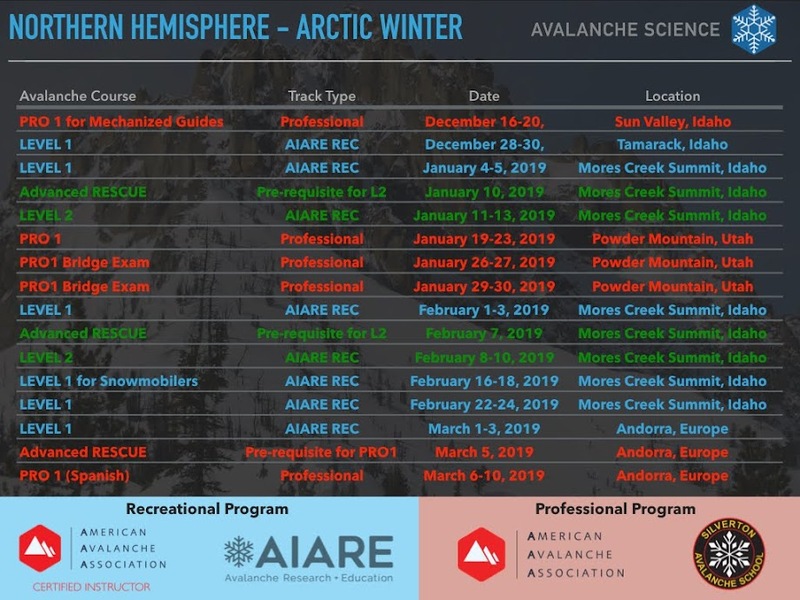 Finally, a link is included below for a for presentation prepared by Jeff Anderson for a National Ski Patrol Avalanche Instructor Conference held in McCall last fall. Jeff is a Hydrologist for NRCS (The SNOTEL guys), an avid BC skier, a contributor to the Mores Creek blog, Guest instructor for National Ski Patrol Avalanche programs, and a friend. He prepared this fabulous material about how to better use the snotel. This link will be added to the blog links.